Durability and practicality come together to create our Storm Slip Knot Med Alert. This unassuming and simple med alert bracelet features a single strand of our sleek gray macrame that goes with practically everything. 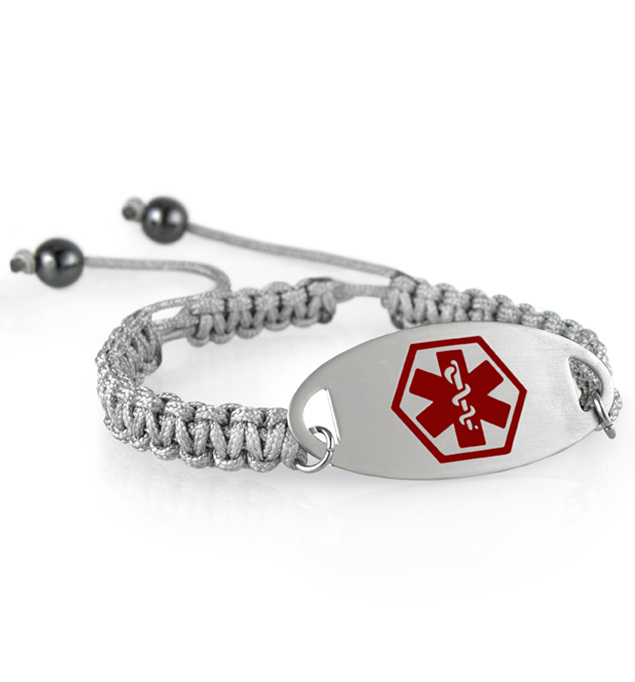 This adjustable medical alert bracelet features an affixed, custom-engravable brushed stainless steel medical ID tag in your choice of red or gray. On-trend and casual, the Storm Slip Knot Med Alert features an adjustable slip knot closure, making it easy to put on, remove, and adjust for comfort. The convenient slip-knot closure makes it a great option for people who find traditional clasps challenging, such as those with arthritis or Parkinson’s. Slip-knots and other adjustable medical ID bracelet closures are also convenient for people undergoing weight loss, such as those who have undergone gastric bypass or gastric sleeve surgery, and those who may experience swelling of the extremities, as may be the case with lymphedema. A little adjustability goes a long way in ensuring that you have a properly fitted, comfortable medical ID to wear every day.